55% of consumers and 70% of B2B purchase decision makers do their research using social media. More people than ever are using social media to influence their purchasing decisions, making your community bank’s social media presence vitally important. A recent study found that 40% of businesses plan to spend more than 20% of their total advertising budgets on social media marketing. Yet shockingly, community banks are still spending the vast majority of their marketing dollars on traditional outbound marketing methods – such as local events, print advertising, and direct mail. If your community bank is one of them, you are missing out on a huge number of opportunities and losing business to rivals who are investing in social. Higher Conversion Rates. Social media lead-to-close rates are 100% higher than traditional outbound marketing techniques. This is probably because it adds a human element to the process – and social media is one of the easiest and quickest ways to engage with customers. Marketing ROI. Just 6 hours per week resulted in increased traffic for 84% of marketers, according to Hubspot. Meaning spending a bit over an hour per day on content can form great results. The great part? You don’t have to be an expert right away. Since social platforms are so flexible, you can learn and adapt as you go. Increases Website Traffic. 80% of marketers confirmed that using social media increased website traffic. So, publishing your website content to social networks is proven to increase website visitors. The Future: By 2020, it’s estimated that customers will maintain 85% of their relationships without talking to a human. This means organizations (including banks) have 4 years to move their marketing to digital and online. 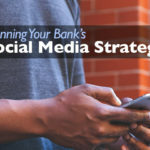 Will Social Media work for my Community Bank? 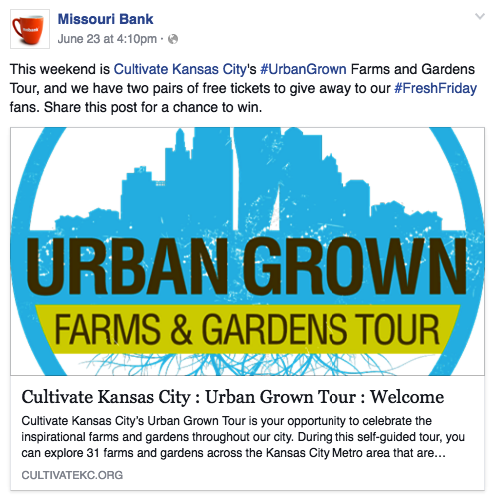 Mobank (Missouri Bank) is a stellar example of a community bank doing social media right. They may be a small (4 branches), but their social media reach is seriously impressive. If you take a look through their Facebook feed you’ll see why. They creatively posts photos and videos from community events, interviews from local business owners, and share customer stories. They even run Facebook contests for concert tickets, and showcase the work of local artists. All of their posts are things you and I would probably be interested in! This strategy may be partly responsible for another benefit – Mobank’s customer satisfaction is extremely high, shown by their 4.9 star customer feedback rating. They’ve successfully built an online community on Facebook that truly engages people from their area. Next, Mobank has over 1,700+ followers on Twitter. 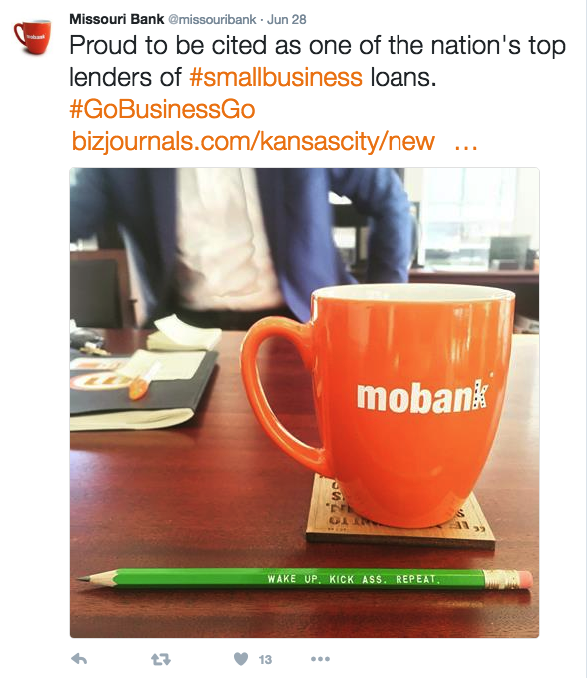 MoBank follows all of their small business partners on Twitter and regularly interacts with them. This not only increases their customer satisfaction, it improves their brand recognition because a whole new network of people are introduced to the their brand. Missouri Bank is an example why your bank doesn’t need to have an massive number of followers to be successful online. Some key takeaways: All their quality content and excellent results are part of a very intentional social media strategy. Secondly, that their social media activity is complimentary to their events and activities (offline) – it’s not a replacement. There’s a reason people love community banks – it’s their focus on personal relationships and customer service that drive business. That’s why small banks continue to boast the highest personal satisfaction scores, according to the American Consumer Satisfaction Index on banking. So, taking Mobank’s example, you can use social media marketing to communicate your bank’s passion for service and community investment and combining that with establishing your authority and expertise as a financial institution. Starting a social media marketing campaign can be overwhelming, and that’s why it’s crucial to develop a strategy or plan, and stick to it. Here are some simple steps to follow when planning your social campaign. Brainstorm: what are you trying to accomplish? Whether it’s attracting millennial customers, educating your audience with financial tips, engaging with existing customers, or providing resources to small business owners, creating measurable goals and ways to achieve them is key. You need to know the “who?” So start by identifying who the primary groups of people you’re trying to reach. Type of customer, occupation, income, age, gender, interests, etc. (Here’s a great guide on creating buyer personas ). Think about the challenges they face, and how you can solve those challenges for them. Be sure to keep it simple when targeting different personas, choose the demographics that make up the majority of your customers and put them in priority order. When, where, what and how? You need to decide what content you’ll be posting. We recommend by starting with addressing common problems or concerns. Those might be financial or something like building trust. Then create a schedule for delivering your content across your website and social media profiles. Blogging is the backbone of a successful social media strategy. Consistency is key. 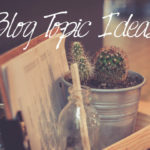 Try to write posts that are highly relevant to your target audience and that are helpful and educational. Remember, publishing content that your audience wants to read will boost engagement and traffic to your website. 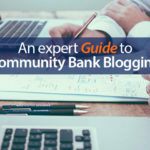 (For more helpful tips read our post on community bank blogging). If you’re looking to really ramp up your bank’s social presence, try speaking with an inbound marketing agency about a social media strategy and campaign. Facebook is the best channel for building a community, simply because it has the widest user base of any platform. If you’re only able to focus on a single social media platform, make it Facebook. This is a great place to post longer articles, videos, and photos that will resonate with a large audience. Twitter is awesome for responding to instant feedback in real time, like complaints, concerns, and praise. It’s a powerful tool for understanding your bank’s market, because it gives you the ability to know what consumers are thinking about your brand. Try posting short updates and links to your blog, accompanied by an image that pops. LinkedIn Can help boost your brand credibility and connect you with potential small business clients. It’s the most professional of the three, so your posts should reflect that. LinkedIn’s Slideshare is a great platform your bank can use to publish research, financial tips, and other helpful information for small businesses. If this article was helpful, read our Community Bank Marketing Tips.